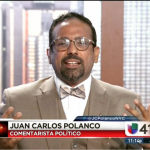 Bronx attorney and former Public Advocate candidate Juan Carlos (J.C.) Polanco inadvertently took it on the chin in Sunday’s NY Post editorial shaming Public Advocate Letitia James for unnecessarily taking public matching funds in her blowout against Polanco. The Post editorial excoriated James for taking over $750,000 in public matching funds from the city’s Campaign Finance Board. Which means she outraised him by 4,000 percent — yet still got a bath of taxpayer funds. The law cuts public matching funds by three-quarters if a candidate has no serious opponent. But the legal rules for “serious” are laughable: Merely because Polanco had made many talking-head appearances on NY1 and Univision, James was able to oblige the Campaign Finance Board to pay her the full amount in matching funds. And on Election Day, she won 74 percent of the vote to Polanco’s 16 percent, with minor-party candidates splitting the rest. Although he lost against the Tish James juggernaut JC raised/spent $26,000 (no matching funds) and got 172,000 votes citywide, while independent mayoral candidate Bo Dietl raised and spent $1.3 million for a mere 10,000 votes. Polanco’s supporters say that his anemic fundraising was due to a certain element within city GOP politics withholding support because his criticism of President Donald Trump. Things are still good for Polanco as he has resumed his career as the NYC regional director for Assembly Minority Leader Btian Kolb. He continues to be a sought after political commentator on NY1’s Inside City Hall/Road to City Hall and Pura Politica, and Univision news. He also continues as an adjunct professor at the Borough of Manhattan Community College where he teaches 12 course sections a year. This post is an expanded version of the item that appeared in The Bronx Chronicle’s “Bronx Political Buzz” column.